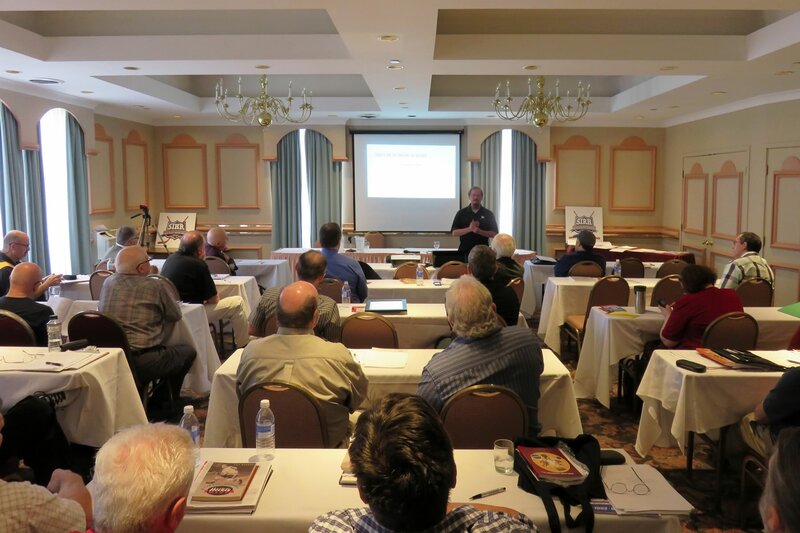 SIHR's 2015 Annual General Meeting (AGM) was held in Fredericton, New Brunswick on Saturday, May 16 at the Fredericton Inn. Past SIHR president and founding member Ernie Fitzsimmons with his wife Marlene, and SIHR Treasurer Iain Fyffe were co-hosts of the event. It was the first gathering of the Society in the "City of Stately Elms" in 18 years, since the 1997 AGM. The weekend affair got under way on Friday night with a "jersey meet-and-greet" in the Bicentennial Room of the Fredericton Inn. 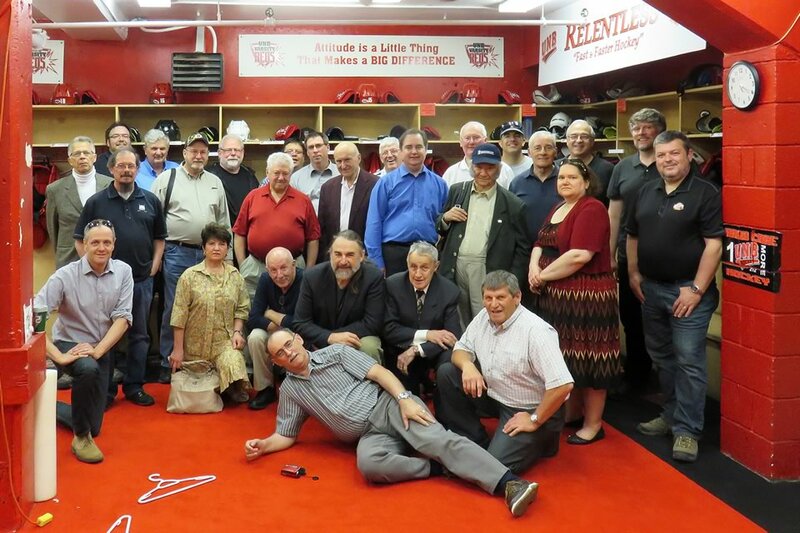 Mr. Fitzsimmons decorated the walls in the room with large posters of players who made the NHL from the two AHL clubs that called the city home (Fredericton Express [1981/82 to 1987/88], Fredericton Canadiens [1990/91 to 1998/99]), as well as with posters of local players who had notable careers. The guest speaker of the evening was 13-season NHL veteran Danny Grant. The right wing played in the big league with Montreal, Minnesota, Detroit and Los Angeles. He tallied 736 points and 263 goals in 736 regular season games, and won the Calder Memorial Trophy (outstanding rookie) in 1968/69 for setting an NHL rookie record for points (65) and tying another rookie record for goals (34). Grant also appeared in 566 consecutive NHL regular season games (12th longest streak of all time). Hockey Hall of Fame Resource Center and Archives Manager Craig Campbell brought the Calder Trophy from the Hall to the meet-and-greet to honor Grant, and members as well as local fans chatted with the four-time 30-plus NHL goal scorer and took photos with him and the trophy. A little latter that night, Mr. Fitzsimmons gave a presentation about Fredericton's two AHL franchises. 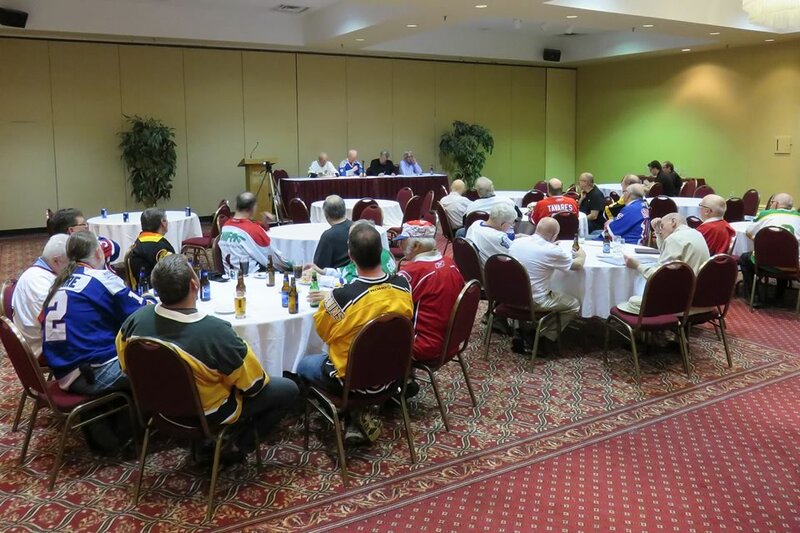 The talk was complemented by Danny Grant (his last pro year was with the Express in 1981/82), who gave his account on how Fredericton got its first AHL club, and by local businessmen and staunch local sports backers Peter Allison and Dave Emmerson, who differentiated between the painful negotiations that brought the Express to town and the pleasant dealings that brought in the Canadiens. The AGM was held in the Crystal Room on Saturday and 34 members were in attendance. The group observed a moment of silence for two SIHR members from Ontario who recently passed away. Lloyd Penwarden of Kingston died on February 8 in his 97th year, and Terry Kelly of Oshawa, died on January 16 at the age of 83. Honorary President Ed Grenda gave a descriptive eulogy on both of the gentlemen. During the Business Agenda, many projects were put into practice. The SIHR Constitution will be updated to better serve the membership: a motion was carried to form a new constitutional committee to improve and modernize the SIHR constitution. It was passed nearly unanimously that the election of representatives on the board of directors will be done on a society-wide basis, rather than only being reserved for those who are present at an AGM. Jean-Patrice Martel prepared and delivered a speech recommending that Article 15 of the SIHR constitution (on voting) should be amended so that all members could participate in the balloting process. Wayne Geen has already been tasked to seek out the most efficient way to implement this truly democratic method. Honorariums will now be endowed to those in key SIHR positions as a reward for service. Treasurer Iain Fyffe's proposal that the Journal and Bulletin Editors should be given $300 each on an annual basis was enacted, while it was also agreed that the President and Secretary should be given up to $300 for travel expenses to the SIHR meetings. Several inactive committees were discharged. Interim president James Milks "trimmed the fat" by proposing two motions to shore up SIHR's committee roster. The first was to discharge the existing constitution committee as the executives committee felt the process was not meeting the needs of the society in a timely manner. The second was to eliminate eight other committees, which have either been inactive for an extended period of time, no longer have a purpose, or no longer have a champion to move them forward. 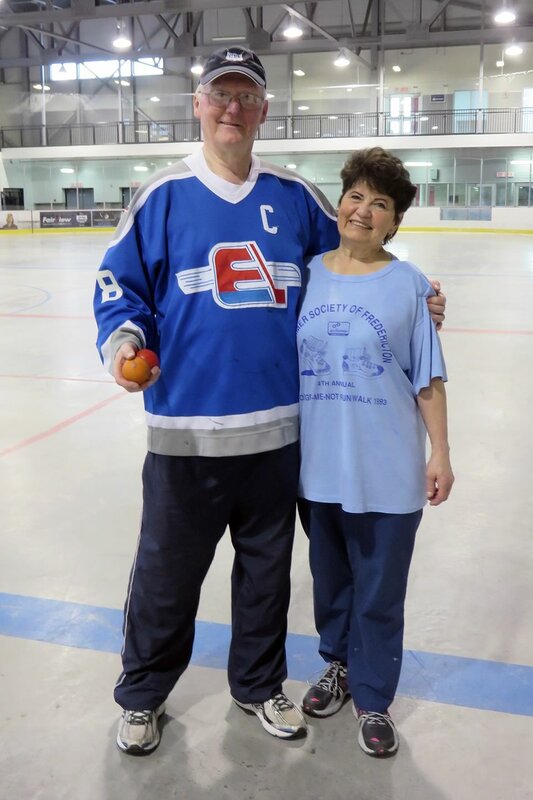 There were reports from the Origins of Hockey Committee by Ed Grenda; the Website Committee by Ernie Fitzsimmons; the Oral History Committee by Monika Moravan; the Bulletin Committee by Benoit Clairoux; and the Minor League Hockey Committee by Jim Mancuso. No formal statement was made from the Journal Committee, interim president James Milks proudly announced in his address that there will be two volumes of the SIHR Hockey Research published in 2015. The first should be ready by late summer and the second ought to be released before the holiday season, thanks to the efforts of former Journal editor Jayson Hron, current Journal editor Kevin Shea and editor "extraordinaire" Lloyd Davis. Elections took place and three of the four seats on the Executive Committee changed hands. Incoming officers are: Jean-Patrice Martel (Chambly, Quebec) as President; Jim Mancuso (Utica, New York) as Executive Vice-President; and Monika Moravan (Mississauga, Ontario) as Secretary. Iain Fyffe (Fredericton, New Brunswick) is the only returning officer. The current four-seat Executive Committee is the most diverse in the 24 years of SIHR and is "full of firsts". For the first time ever, each member of the executive board is occupied by an individual from a different province/state. Mr. Martel is the first person to be elected SIHR president in nonconsecutive terms. Mr. Mancuso is the first American citizen named to the executive and Ms. Moravan is the first woman named to the executive. New members added to the SIHR board of directors are: Ed Norris (Lancaster, Massachusetts) as Vice President USA East; Kevin Slater (Oakville, Ontario) as Director-at-large Canada; and Martin Harris (London, England) as Director-at-large International. 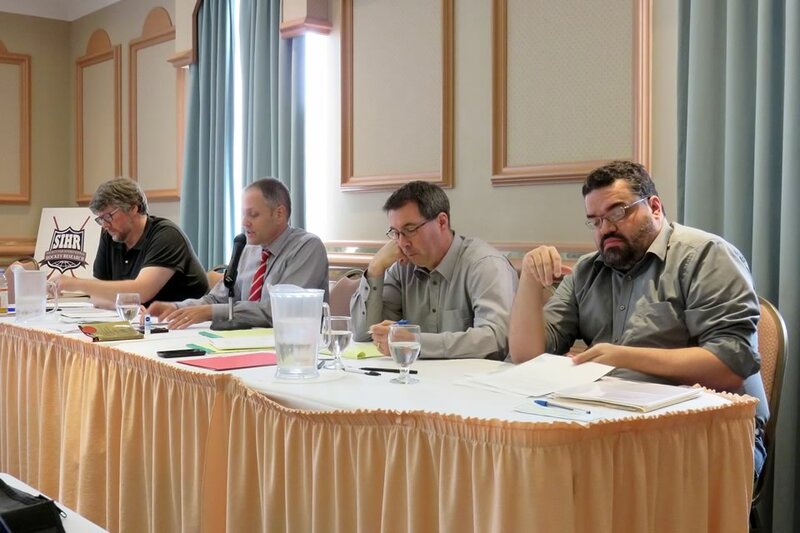 Board representatives who are back for another term are: Ron Leger as VP Atlantic; Benoit Clairoux as VP Quebec; Waxy Gregoire as VP Ontario; R.J. Pratt as VP Canada West; and Roger Godin as VP USA West. SIHR accolades were bestowed to well-deserved members. 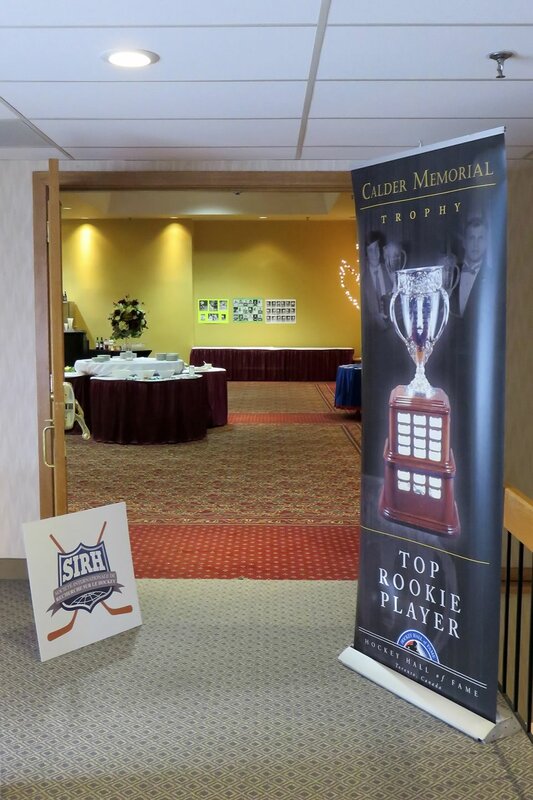 The Brian McFarlane Award for outstanding writing and research went to Dr. Carl Giden, Patrick Houda and Jean-Patrice Martel, for their distinguished and enlightening book On the Origin of Hockey that has received more worldwide media coverage than any other publication done by a SIHR member. Dr. GidÃ©n and Mr. Houda had also shared the Award in 2010 for their unique and detailed timeline of hockey. The President's Award for outstanding contribution to SIHR was presented to Ron Leger. Mr. Leger is a long-term and dedicated member of the Society who has served on the board of directors for almost 20 years. He attends most meetings and truly exemplifies the goodwill spirit of SIHR. Mr. Leger had members over to his house in Moncton on Saturday evening and Sunday to see his massive collection of hockey memorabilia. Roger Godin gave some details about the upcoming 2015 SIHR Fall Meeting in St. Paul, Minnesota. The exact date will be determined once the NHL schedule is available since the Wild will be hosting our group. The Friday night meet-and-greet will take place at Tom Reed's Hockey City Pub (258 7th Street West) and the Saturday meeting will convene at the NHL club's headquarters building (317 Washington Street, next to the Xcel Energy Center). The host hotel will be the Holiday Inn (175 W 7th Street), situated right across the road from the Wild's arena. Arrangements could not be made for a ball hockey game on Sunday, but in its place a tour of the State of Hockey Tribute (a series of 39 exhibits on the four levels of the Xcel Energy Center) will be conducted by Mr. Godin, who is the Wild Team Curator. The location of the 2016 AGM was revealed and it came as no surprise that Kingston, Ontario was selected to commemorate the 25th anniversary of the inaugural SIHR conference, which took place in the "Limestone City" on May 18, 1991. Ed Grenda spoke briefly about tentative plans for the historic event. An official SIHR 25th anniversary logo will be designed for the occasion. In the afternoon, there were three presentations made. "Big Bang Theory, Missing Link, or What is Hockey?" by Michel Vigneault theorized that you must first make an operating definition of what you consider hockey to be before you can scientifically research the sport's birth or origins. Dr. Vigneault stated that he wished to withdraw his signature from the Origins of Hockey 2002 Report, as he no longer agrees with the definition of hockey provided in the report. 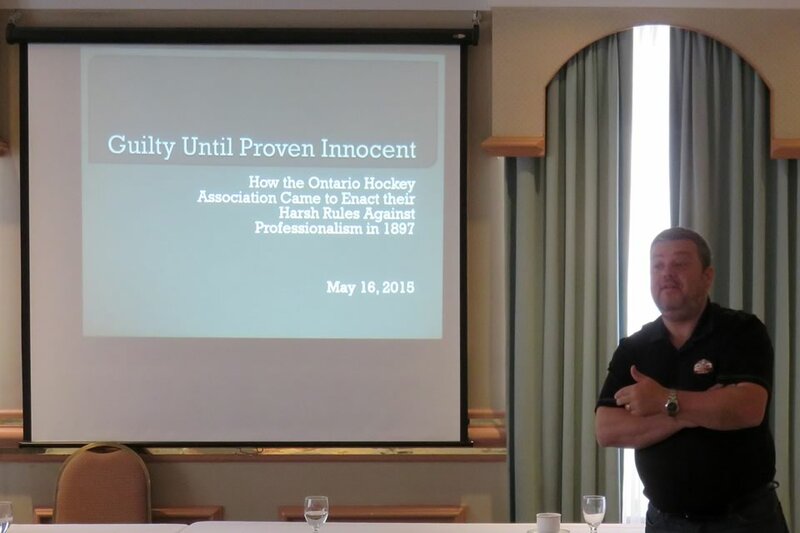 "Guilty Until Proven Innocent â€“ How the OHA Came to Enact Their Harsh Rules Against Professionalism" by Kevin Slater explained why the OHA cracked down on creeping professionalism in its district in the 1890s. "The Canadiens on Television" by Jean-Patrice Martel gave us a chronology of Les Canadiens de Montreal on the small tube. There was a break after the first two speakers in order for the group to be on time for a scheduled "behind-the-scenes" tour of the University of New Brunswick (UNB) Aitken Center. Our guide was Dave Morrell, a two-time AHL James H. Ellery Memorial Award winner (presented in recognition of outstanding media coverage of the AHL, which he won under the "radio" category). 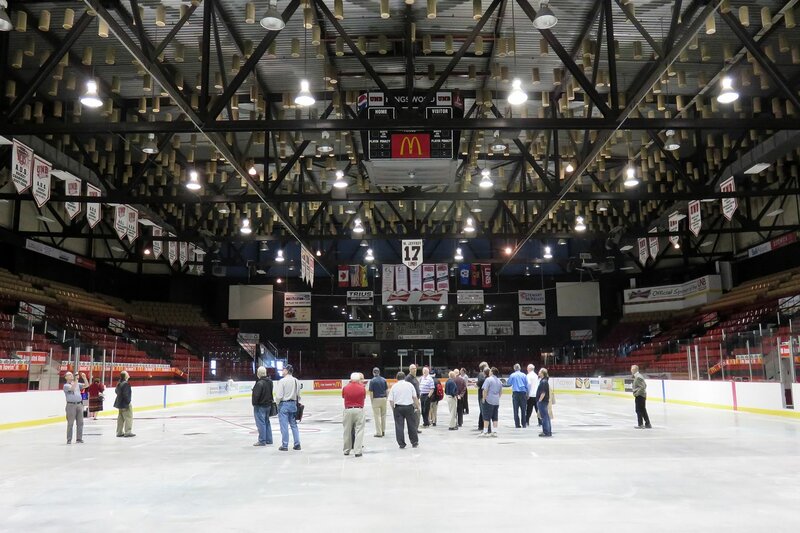 The rink was the home of both the Fredericton Express and Fredericton Canadiens. Mr. Morrell displayed an encyclopedic knowledge of the building as he walked us through every corner of the facilities. He took a particular interest in telling us how the UNB Redsâ€™ hockey program evolved over the years and about the training routine and life cycle of a Reds player. 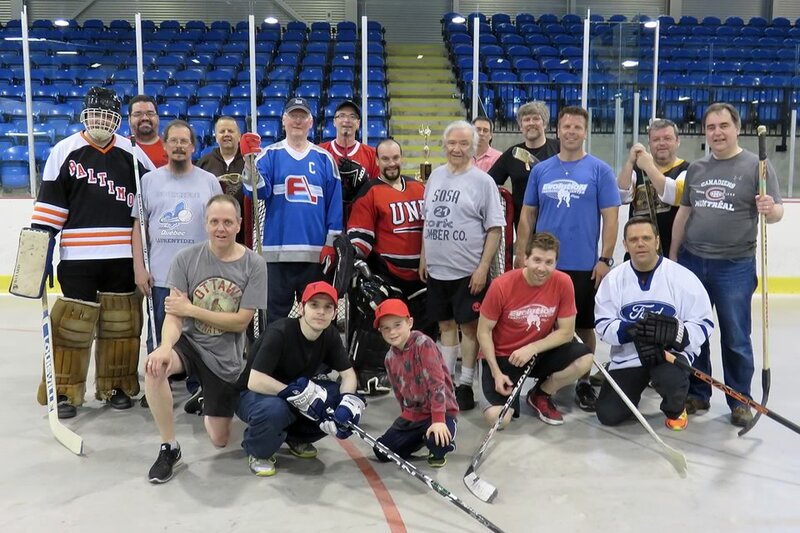 On Sunday morning, a ball hockey game was staged at the Willie Oâ€™Ree Rink that gave members an opportunity to burn off some calories after the sedentary lifestyle of the weekend. There were a surprising number of participants for the friendly competition. Team Atlantic topped Team World to win the Fitsell Cup. 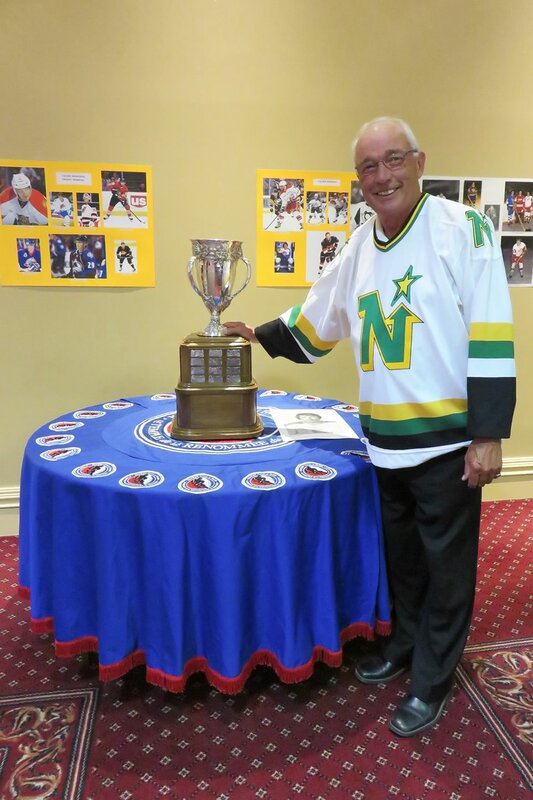 Guest Danny Grant posing with the Calder Trophy, which he won in 1968-69.